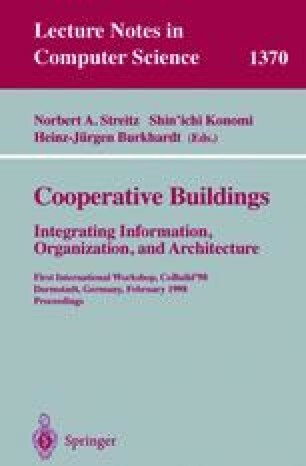 This paper combines work practice research (CSCW) and architectural design & planning for discussing cooperation-support. A specific vocabulary for talking about cooperation is introduced: transformation layer, intermediate space, vista and social transverse. It is used for analyzing people’s needs for places and boundaries on the one hand, for boundary crossings and the adaptability of spaces to temporary and unforeseen uses on the other hand. We illustrate our approach by a system prototype-in-design, based on the metaphor of ‘Wunderkammer’, a 3D multimedia environment for assembling inspirational objects.